Hockey demands speed, stamina and a mastery of intricate hand-eye coordination. The fast pace and high impact nature of the sport means it is not uncommon to see more than 100 substitutions in a game, with subs allowed to roll on and off throughout a match. Green card: Shown when a minor offence is committed that does not warrant a more serious sanction. Two greens equal a yellow. Yellow card: A player must spend a minimum of five minutes in the sin-bin with the umpire deciding how long. Red card: Sees a player permanently excluded from the game. Golden goal: If extra time is required during the classification stages of the tournament, the team that scores the first goal – the golden goal – wins the match. Penalty corner: Awarded for a variety of different infringements (usually in the shooting circle), penalty corners are taken from the back line, 10m either side of the nearest goalpost. Only five defenders are allowed to defend penalty corners, which are also known as short corners. Shooting circle: An arc in front of each goal. Goals can be scored only from within the shooting circle. 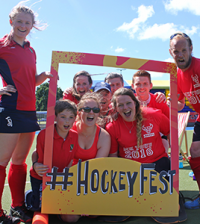 Hockey is played on a 100 x 60 yard outdoor water-based synthetic-turf pitch by two teams of 11 players. Matches are played over two halves of 35 minutes each on pitches. Players use hook-shaped sticks to advance a hard ball towards their opponents’ goal, the winning team having the most amount of goals scored. The team is made up of attackers, midfielders and defenders with each team also having a goalkeeper. To take a shot on goal, players must be inside their opponents’ shooting circle. Each nation can bring a squad of 18 to the Olympics and on match-days name a 16-man team. The five substitutes can be rolled-on-and-off at anytime. In both the men and women’s competition 12 teams will be divided into two pools of six, with each team playing every other team in their pool. The top two teams from the groups will qualify for the semi-finals, with the winners going head-to-head for the gold, and the losers the bronze. Alex Danson (pictured). 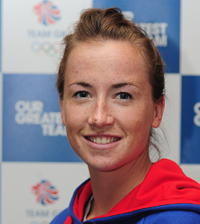 She has competed in four European Nations cups (winning three bronze medals), three World Cups (winning one bronze medal), four Champions Trophies (winning one bronze and one silver medal), three Champions Challenges (winning gold and bronze medals), two Commonwealth Games (winning two bronze medals) and the 2008 Beijing Olympic Games. Holland are always tough opponents and they won gold at the Beijing Olympics. Argentina are also ones to watch, having won bronze in Beijing and also winning this year’s Champions Trophy beating GB in the final. 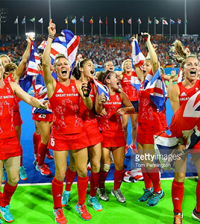 Holland or Argentina, but after an impressive year for GB, including winning silver at the Champions Trophy, we have every chance of taking gold, especially with the home advantage. For the first time ever at the Olympic Games, the London 2012 hockey pitch is blue, rather than green.